T and I saw Rent on Thursday at a local movie theater (Kerasotes City North 14). No, not that cheesy Chris Columbus version (can you imagine if the Harry Potter series kept him as its director?). Rather, this was the final live Broadway performance caught on film. Admittedly, T and I were a bit skeptical going into the evening. One of T’s friends from California gave us a bootleg tape of a Broadway show, and we were wondering if the quality of this movie version would be only a notch above. Thankfully, we were overwhelmingly surprised with the quality of the taping. Sony’s The Hot Ticket filmed the performance with multiple cameras, and for someone who’s seen the musical numerous times, I was blown away at the amount of detail that was captured with the production. It was such a delight to see so many of the small nuances that you miss without the zooming capabilities of cameras, and I’ve been fortunate enough to have had some decent seats in both the touring production to Chicago, and my one viewing at the Nederlander on Broadway. The editing is fast, so it’s a challenge to keep up for a few of the numbers, but I felt that they did a great job of making you feel like you were at the theatre, right down to the 10-minute intermission. Our theater was sparsely populated, but we managed to get a decent amount of clapping during Angel’s solo, “La Vie Boheme”, and “Take Me or Leave Me”, and even some “moo”ing during Maureen’s solo. Plus, at the end, as I somewhat expected, we were treated to an encore of “Seasons of Love” by the entire cast along with notable alumni in attendance including Anthony Rapp and Jesse L. Martin. If you’re reading this post currently, I highly recommend plunking down the $20 to see it this weekend (Sept.27-28). If you’re reading this later, stay tuned for the rumored release of the DVD, hopefully in early 2009. This post has been in the works for awhile now, but I’m finally ready to publish it. I could write more as there’s so much to talk about, but I need to work on other stuff, so I’ll add edits as needed. Enjoy! Whenever I’m about to make a major purchase, especially a new gadget, I usually do my homework, read the reviews, search the forums, and then look for a good deal. The iPhone 3G purchase was no different. In fact, I spent a great deal of time researching the gadget, focusing specifically on the advantages and disadvantages of the iPhone compared to a Windows Mobile device, namely my former i760. I’m also willing to admit that I even ETF’d my Verizon contract, just four months after signing a new 2-year agreement. Ouch! With all of that said (and a $150 penalty), what follows below are the results of my findings. Perhaps, you too will join me as a former WM user and a proud new iPhone 3G user. One of the biggest issues preventing me from converting to the iPhone was the lack of the tactile keyboard. I had played around briefly with the iPhone and was definitely worried about the electronic keyboard. I had the hardest time pressing the “o” button, and couldn’t imagine life without the immediate response that my i760’s keyboard gave. I had read that it took about 1 week to get used to the keyboard and about 1 month to really become accustomed to the device. Sure enough, about 1 month into the iPhone, I can confidently say that the keyboard is easy to use, responsive, and I’m even one of those people who will claim that he can even type faster on the iPhone keyboard. Remember, I was a Windows Mobile user for over 4 years, and still have a PC as my main computer, so I’m not an Apple fanatic by any means. I do have a MacBook, which I enjoy, but a PC will always have a place in my home. One of the advantages that PC’s seem to have over Macs is the amount of software that is available for the platforms. This seemed to be true with the Windows Mobile devices vs. the Apple iPhone. I know I’ve spent hours of useless wandering at sites like Handango searching for that perfect application that would make my i760 even better. That all changed in June when Apple released the Apps Store. While I don’t mind paying for a good piece of software, a majority of programs on the Pocket PC seemed to cost anywhere from $9.99 to $29.99. Alternatively, on the iPhone, you have apps costing anywhere from Free to $9.99 ($999 if you were “lucky” enough to get the “I am Rich” app before it got pulled). I’ll admit to being so excited about the Apps Store that I researched several of the coolest free apps before I even purchased the iPhone. What other device inspires such a high level of interest? One of the biggest complaints thus far with the iPhone 3G has been its meager battery life. I will freely admit that I can barely make it a full day with my iPhone. However, let me tell you what I was doing with it: Surfing the web for over an hour, pulling (I’m still getting used to the term, “fetching”) my email every 30 minutes from 2 accounts, checking the news on a native app, using GPS and Maps to get me from place to place, playing songs for an hour in my car, and checking scores and stocks every hour. This is what I would deem “heavy usage”, and I can assure you that if it were even possible to do all of this (without crashing) on my i760, my battery would not last the 5+ hours that it did on the iPhone. On top of all of this, I never have to check my memory on the iPhone. With the i760, I was constantly checking to see if I was running low or on the verge of crashing. I always had to close applications to conserve memory. Funny story: Before purchasing the iPhone, I asked a few “Geniuses” (and I use that term loosely) at the Apple Store about how I could check the memory usage on the iPhone. I haven’t seen that many blank stares since my last lesson on stoichiometry in my chemistry class. I haven’t seen the word “snappy” used so much in my life. One trip to either macforums or apple forums about the iPhone and you’ll be bombarded with posts both praising the iPhone’s snappiness (read: fast responsive interface) and complaining about how the 2.0 and above updates have taken away from the original iPhone’s snappiness. 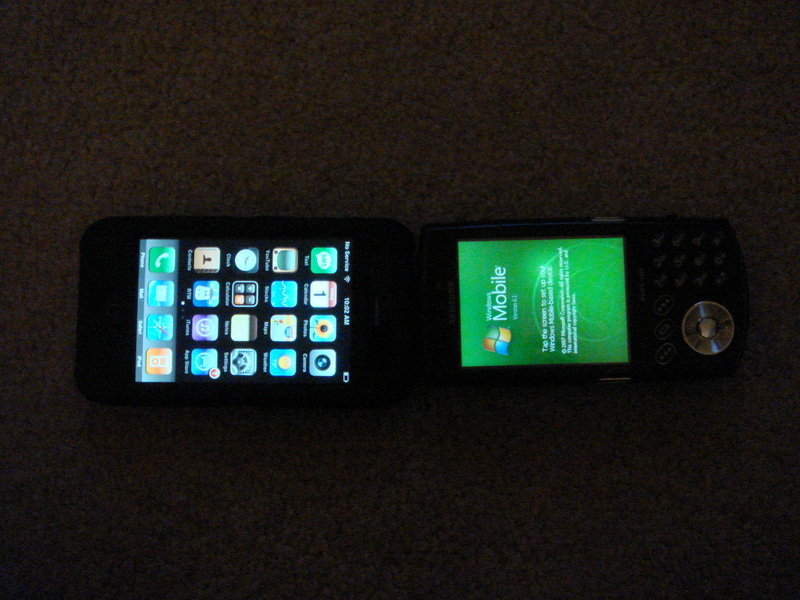 As a Windows Mobile user, I played around with a lot of different looks with the i760. I admit that this was a lot of fun at times, changing the look and interface using programs like SPB Mobile Shell and Ultimate Launcher. However, I ended up wasting a lot of time and patience doing this, and I know that many others do the same, some even trying to imitate the iPhone. Yes, the i760 and other Pocket PC’s have a touch screen, but nothing, and I mean nothing can compare to the Apple’s multi-touch screen. It is truly amazing, and although I have experienced some lag with email, contacts, and text messaging, these are lags that I faced as a WM user as well, and a small price to pay for everything else that I get. Plus, there’s the 2.1 update, not to mention all future updates that will continue to roll out (I know that there are 2 ways to look at this: 1) don’t release a product if it’s going to need updates or 2) Apple is continuing to refine its product and will let consumers in on the changes. I prefer to think in terms of the latter). One thing that I will not miss on the i760 is the small screen. The 3.5 inch diagonal on the iPhone gives you a lot of real estate to work with. Pictures, videos, and email are all beautifully displayed. As mentioned above, the multi-touch experience is a nearly flawless one, and I’m sure that future WM phones will incorporate this (I think it’s in the works for the next update of Windows Mobile, though I’d think that they’ll have to one-up Apple somehow, somewhere). I cannot wait to get Slingbox back on a portable device. I do miss that from the i760, but rumors have it that an iPhone application is in the works. Score one for the i760 here. There’s no denying that Microsoft is going to win out since its own device should work seamlessly with its own programs. I’m not a huge business user, so I did not need to edit Word docs, Excel spreadsheets, and Powerpoints on the fly. Although I am sure that there are going to be ways to do this on the iPhone, you are probably better off sticking with the Pocket PC. If your needs are less intensive, the iPhone offers a decent alternative for all of those programs. I can view most MS Office documents just fine, and unlike the i760 (unless accompanied by a 3rd party email program like Flexmail), I can read HTML emails as intended on the iPhone. The calendar application on the iPhone is pretty cool, though I was able to add more details into an appointment on the i760. You’re probably familiar with the contacts app on the iPhone already, and there are some decent look-alikes on the Pocket PC, but it’s much smoother on the iPhone, even with the occasional lag at the beginning. Lastly, syncing with the iPhone has been much slower than with the i760. Since it’s through iTunes, it is a bit of a tedious chore to sync repeatedly. Unlike Activesync, which would automatically sync when new information was entered, I have to manually sync the iPhone via iTunes. With all of the trouble I’ve had in the past with Activesync, I never thought I’d actually be praising it. In addition to the above points, the iPhone adds several more bells and whistles that just add to the overall experience and “coolness” factor. These include Visual Voicemail, the accelerometers (dim when close to ear, “shakeability” for apps, smooth portrait/landscape transition), and conversational text messaging. I don’t use MMS, so I don’t really miss that, and there seems to be some apps to work around the inability to store files on the iPhone. Would copy/paste be nice? Sure, but having GPS on my phone more than makes up for that. The i760 only had Google Maps and was not able to “find” your location. I’d be interested and happy to discuss any other differences in case you’re like me and was on the fence of getting an iPhone. Leave a comment, and I’ll be sure to reply. Again, I don’t want to make it into a Windows vs. Apple debate. They both have their strengths and weaknesses, but the iPhone has firmly established itself in my opinion as the gadget of all gadgets. Well, it’s been awhile since I posted. I knew it was only a matter of time before I slacked off. However, I do have a good excuse (read: getting married), I promise! What better way to return to Chanatown than with an iPhone Firmware update! This time, only a 237 mb download. Thanks Apple! 5:53am – I couldn’t sleep in – time to update my iPhone! 5:55am – Plugged in phone, started iTunes (running iTunes 8 on a PC)….waiting…waiting…why so slow, iTunes? 5:58am – iTunes error with database syncing. What? 6:52am – “Syncing iPhone…”, “iPhone is activated” mesage on phone, Sync in Progresss. All done! Under 42 minutes from start to finish. I’m hooking up to my Macbook now to sync my music, photos, and apps. This was just a little bit longer than the 2.0.2 update (see below), notably during the “Preparing the iPhone” phase…I’ll post edits on the performance (I’ll be focusing on the contacts lag, email stability (particularly POP accounts), and overall “snappiness”) throughout the weekend. EDIT (9/13): can’t send email via POP account, contacts are noticeably faster, and overall system is more stable. 3G bars seem more available. 7:43pm – Syncing iPhone on iTunes, backup (2 min), syncing contacts/calendars (2 min). 7:47pm – All done! Under 30 minutes from start to finish. I’m hooking up to my macbook now to sync my music and get some new apps! That’s right – 2 computers without a problem! Hope this helped. I’ll post some obs about 2.0.2 later. In the meantime, leave a comment with your impressions of the update. ADD (9:53pm): Still noticing faster response overall, switching apps, no lag on keyboard (I actually had a worse lag after 2.0.1 update it seemed), and mail is checking quickly. I have been strictly on WiFi and will test the 3G/EDGE waters tomorrow. ADD (9/12): Well, there’s still the contacts lag, a bit of sluggishness with text messaging, and trouble with email (mainly POP). Here’s hoping the 2.1 update will finally address these issues.